One of my favorite trends right now is the mustache. It's fun, hilarious, and ridiculous - right up my alley. I'd like to give a shout out to my Pops for rocking an incredible mustache for my entire life. You may remember my friend Bee, from the Baking Soda - Who Knew?, Olive Oil - Olive You, and Shower of Love posts. Bee is getting married soon and I have the honor of being a bridesmaid in her wedding. The best part of being a bridesmaid is planning the bachelorette party. My responsibility was the theme, which so happened to be mustaches! I have been dying to make mustaches on a stick, to hold for photo ops. This was the perfect opportunity. I started by drawing a few different shaped 'staches and cut them out on black construction paper. I made one giant mustache for Bee. To add some sparkle, I combined glitter with Mod Podge and painted the mustache. I also applied Mod Podge to the smaller mustaches to give the construction paper a sturdier feel. For the sticks, I chose wooden sticks I had on hand. I also applied the glitter/Mod Podge mixture for more sparkle. I can never have enough sparkle. When the sticks dried, they weren't completely covered. So I used the same method as in the Sparkle Shoes post. One layer of Mod Podge + Glitter, one layer of glitter only, followed by one more layer of Mod Podge + Glitter. You'll see the results later. The mustaches began curling and taking a weird shape, so I applied, you guessed it, more Mod Podge to both sides. Then I glued a small piece of construction paper to the back to keep the 'staches straight. So how did they turn out? GREAT. These were so much fun to play with and Bee loved them! We also had stick on hairy mustaches that I ordered from Oriental Trading but as soon as we put them on, we breathed in the small hairs, and I was coughing throughout the entire night. 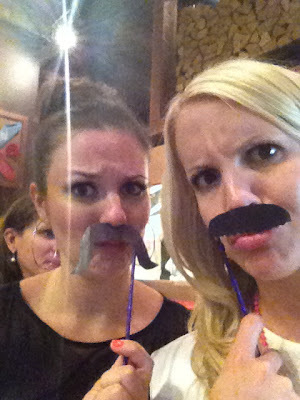 I would recommend the paper mustaches over a hairy mustache any day. 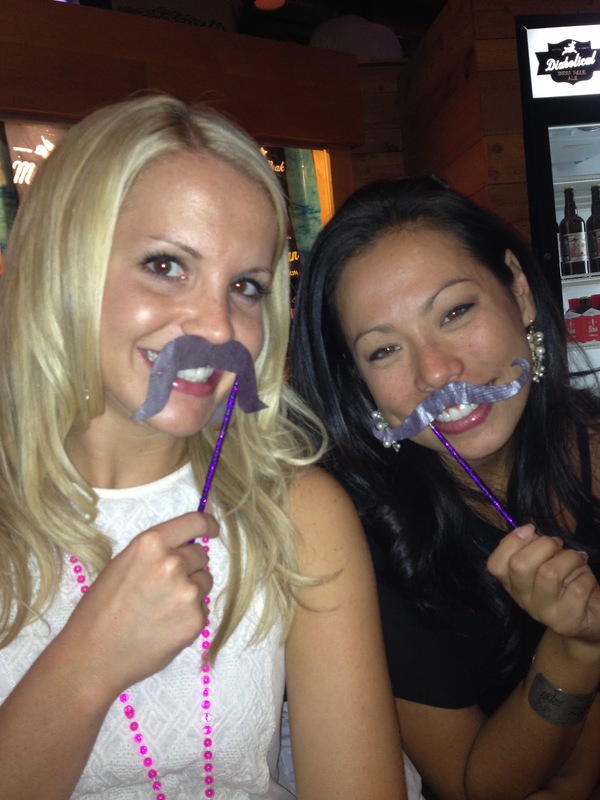 We had hopes of playing 'Pin the Mustache on 70's Burt Reynolds,' from Archie Mcphee's Slightly Less Disappointing Blog,as well, but we were too busy dancing the night away. 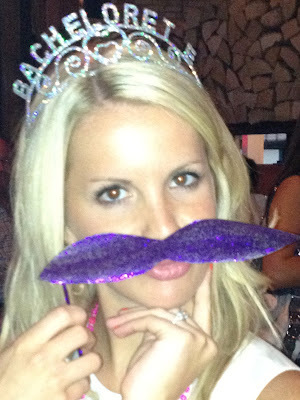 Hope you had a fabulous bachelorette party, Bee!